At a time when Europe and the US are struggling with their own debt challenges, the debt burden of developing countries no longer captures the headlines. Over the last decade in particular, significant efforts have been made by the international community to pursue a more comprehensive approach to debt relief. In this process, greater attention has been paid to strategies and mechanisms to improve the development and poverty impact of debt relief and the financial means thus released. This has been the case for instance with the “Heavily Indebted Poor Countries” (HIPC) Initiative and the Multilateral Debt Relief initiative (MDRI). Conditionality has become one of the corner stones of debt relief schemes, notably through instruments such as debt swaps for development. In this respect, debt relief has been used more and more as another instrument by donors to purse broader development objectives. As such, it draws interesting similarities with the direct budget support approach adopted by several donors. So, is debt a problem of the past? Is the slate clean? Unfortunately not. Issues arise as to the long-term sustainability of the debt of developing countries, notably some African countries, which depends not only on domestic policies, but also external shocks. In the current precarious global economic environment, with highly volatile commodity prices, debt management and accumulation remains a cause for concern. What mechanisms can best mitigate these debt-related risks? Are vulture funds threatening the long-term sustainability of debt relief? 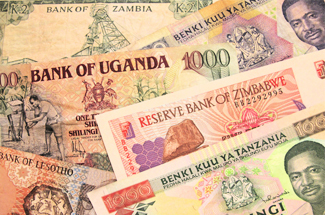 With increasing emphasis from donors on blending grants and loans, on domestic resources mobilization and on policies promoting sustainable inclusive growth, can Africa avoid a new debt trap? These are some of the systemic questions addressed in this issue of GREAT Insights, which draws on the joint efforts of the Dutch Policy and Operations Evaluation Department and the Office of the Special Evaluator of the Belgian International Cooperation. 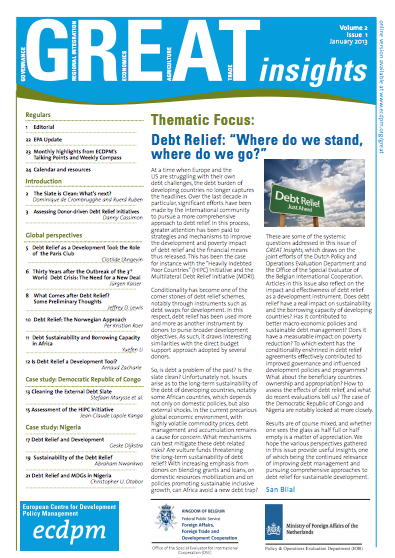 Articles in this issue also reflect on the impact and effectiveness of debt relief as a development instrument. Does debt relief have a real impact on sustainability and the borrowing capacity of developing countries? Has it contributed to better macro-economic policies and sustainable debt management? Does it have a measurable impact on poverty reduction? To which extent has the conditionality enshrined in debt relief agreements effectively contributed to improved governance and influenced development policies and programmes? What about the beneficiary countries ownership and appropriation? 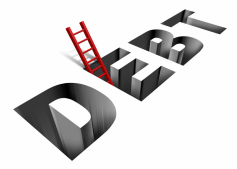 How to assess the effects of debt relief, and what do recent evaluations tell us? The case of the Democratic Republic of Congo and Nigeria are notably looked at more closely. Results are of course mixed, and whether one sees the glass as half full or half empty is a matter of appreciation. We hope the various perspectives gathered in this issue provide useful insights, one of which being the continued relevance of improving debt management and pursuing comprehensive approaches to debt relief for sustainable development. 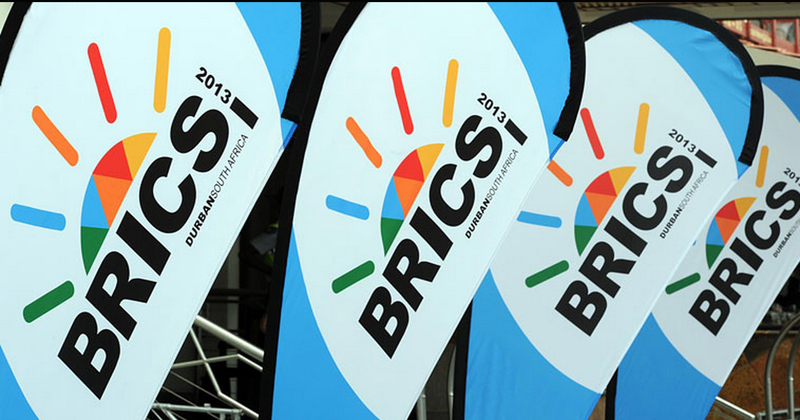 BRIC's Approaches to Development Financing.